Qantas chief executive Alan Joyce says the desire to return the airline group to an investment grade credit rating is unrelated to its consideration of a potential order for Boeing 787-9 Dreamliners. The company has established three criteria that needed to be met before it would consider taking up any of its 50-odd options and purchase rights for the 787-9, namely Qantas International’s return to sustainable profitability, repaying $1 billion of debt and establishing appropriate staff conditions to ensure the business case for the new aircraft type stacks up. Joyce said suggestions Qantas would have to choose between returning to an investment grade credit rating and purchasing the 787-9 were flawed. “If we get the debt down and we get the performance where it needs to be with those returns, then we are going to be at the investment grade rating matrix,” Joyce told reporters on the sidelines of the International Air Transport Association (IATA) annual general meeting in Miami on June 7. “That can be achieved with buying the aircraft in the future. We believe you have to chew gum, walk and sing at the same time. “You have to be in a position where you are investing continually for the future, you are paying down debt and strengthening your balance sheet and getting yourself back to investment grade and you are giving returns back to shareholders. Qantas International chief executive Gareth Evans said the first 787-9 option was for delivery in late calendar 2017, with the remaining delivery slots spread out over the rest of the decade. A decision on whether to exercise that first option would be made in the “back half of this year”. “We’ve got specific pricing, specific delivery slots and the ability to essentially drop and pick up those slots as we desire to do,” Evans said. 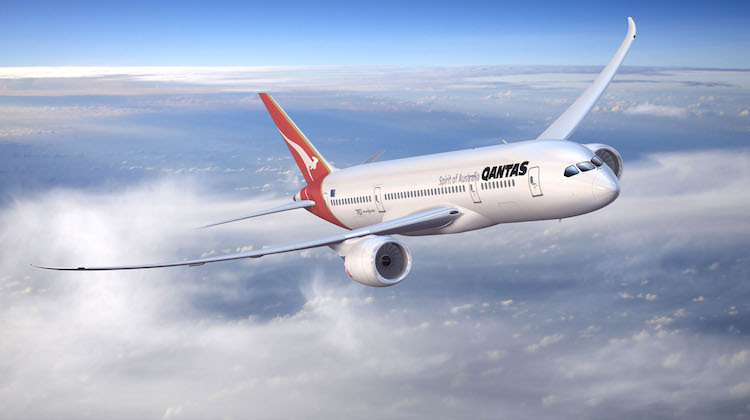 A key plank of the business case for the 787-9 was the recent in-principle agreement between Qantas and the union representing its long-haul pilots for the next enterprise agreement, which included an 18-month pay freeze and provisions for any potential Boeing 787-9 order. Joyce said the deal, which is due to be voted on by the full membership of the Australian International Pilots Association (AIPA), was “significant” given it was the first time there has been a different arrangement for a new aircraft type. “That makes that a very productive arrangement going forward and we shouldn’t underestimate the size and the importance of this agreement with the pilots,” Joyce said. In addition to the options for the Dreamliner, Qantas also has orders for eight Airbus A380s, which have been deferred to a yet-to-be-confirmed date. Qantas has 12 of the double-decker superjumbos currently, which serve Melbourne, Sydney, Dallas/Fort Worth, Dubai, London Heathrow, Los Angeles and Hong Kong (during peak times) and Evans said that was sufficient for now. “I think a fleet of 12 works well for us and we will hold onto those planes through their economic life,” Evans said. Meanwhile, Evans said the alliance with Emirates, now in its third year, has been of mutual benefit to both carriers. Evans said the two airlines combined had put $1.7 billion worth of revenue on each other’s services through their codesharing arrangement. Moreover, the number of passengers travelling on QF-coded tickets to Europe was four times higher than before the partnership with Emirates, Evans said, adding that a “significant proportion” of those extra travellers were those that previously flew with the likes of Etihad, Qatar, Singapore Airlines or Cathay Pacific. “People at the start thought Qantas are just going to be handing their customers over to Emirates. What it has been is much more a partnership of equals,” Evans said. Emirates president Tim Clark said recently he hoped to extend the partnership with Qantas beyond 2018. Oh bloody hell AJ, just place the damn order…..PLEASE!!!!! Clicked on website, saw picture of Qantas-liveried 787. Hey, I thought, finally, they’ve placed an order. Scrolled down, actually read the headline and got blasted straight back into reality. Got a little bit excited for a few seconds! Historical performance shows since the change in CEO’s there has been no shareholder dividend declared and and the share price has dived. The board has been silent, very few listed companies on the ASX would have played the same game successfully, full pockets or long arms ? I thought QANTAS was up against a 6000 lb gorilla??? Wheres this $$$$ coming from??? Such an over rated aircraft. I wish they would order the A350 and take some of there additional A380’s. For all those people who thought the A380 was an answer to the Airlines dreams, well maybe they should thinks again. The same for the A350; most if not all Airbus Aircraft are lemons.. Take for example the A380; no new orders since 2013.. The fact of the matter is that the future lye’s with aircraft like the Boeing 787-900 which will do the job of the A380 in one foul swipe. It will allow airlines like Qantas to schedule more frequent flights to for example Los Angles. Instead of two flights a day to the USA it will allow more variety of departure times; more frequency; in other words the possibility of up to 5 or 6 different departure times during any one day and with the event of the Badger’s Creek airport; with no curfew will give the public what it needs. more choice. The days of the large capacity aircraft like the A380 and the 747 are coming to an end. I think a couple of A380HGWs for Dallas would be good, and then some 789s as well as 10s for higher capacity for say Bris to LA and Dubai (I think it has the legs) as well as Syd Tokyo or Sing. Then maybe A350-1000s for the second flight to LA or LHR. By the way the QF share price is quite healthy at the moment. The 787 is the most efficient and advanced bird in the skies. Is the decision really that difficult? What ever the outcome of the procrastination about the 787-9, does anybody think that if they eventually come they’ll be like JAL and ANA’s 8 across or do I hear a chorus of “Tell him he’s dreaming”. Yuck! flying to Vancouver or San Francisco with Jetstar spacing would be a nightmare! Also, would QF be able to fly Dreamliners into European destinations via DXB that Emirates are not permitted to – places such as Berlin? Yes it is. A decision to invest multi millions of dollars has to result in a profit otherwise why bother. If the cost of purchase and running is greater than the expected revenue then it is a dud investment.So Qantas management have been right in the money when they say the business case has to stack up. That includes a sensible agreement with the AIPA. I understand that currently Qantas international pilots in comparison to other equivalent airlines fly fewer hours per month which means extra pilots have to be employed to maintain services. Who picks up the cost? Us passengers who decide to support Qantas and pay higher fares. Is it value for money – no. adammudhen, damn shame the artist impression on the 787 is wrong as the tail has the Qantas 1984 livery and not the ‘New Roo”. But yes, an order and delivery of the planes would be choice.